A box of quinces freshly picked from my friends’ tree was a wonderful parting gift from my visit to Melbourne. I’m not talking about a shoe box but a carton that had previously held one dozen bottles of wine. That’s a lot of quinces. Stringent quarantine laws prohibit an individual transporting fresh fruit between Australian states so I before heading off to drive the 1800 kilometres home, I had to peel, core and cook the boxful of quinces. Thankfully I was visiting my daughter in her brand spanking new, well equipped kitchen. It was a big job. I took 3 days to oven poach all the quinces to ruby redness, each batch taking 4-6 hours. Once done I packed the quinces into whatever containers I could beg, borrow or steal. Once I was back in my own kitchen I made a huge batch of quince paste. And still I ended up with a large tub of frozen quinces, too much to use up for breakfasts so I was inspired to make dessert. 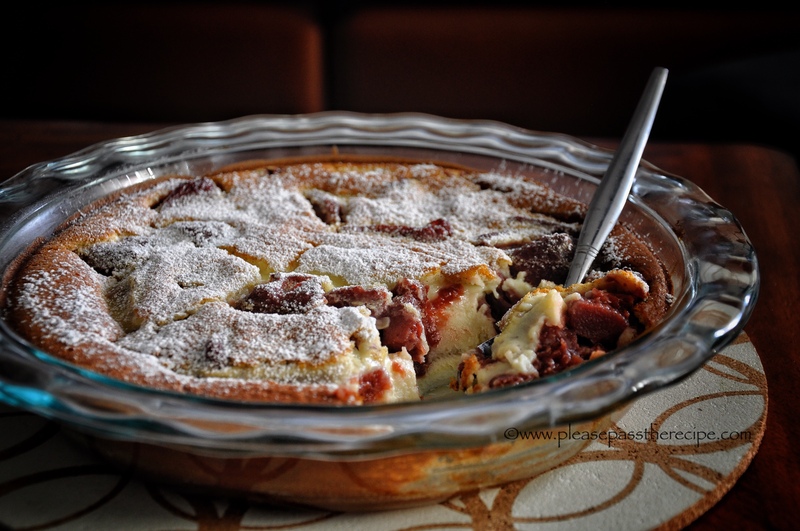 In autumn let year I’d filed away a recipe for plum clafoutis posted by my blogger friend Francesca at “Almost Italian”. I’ve never made clafoutis before, in fact I don’t think I’ve ever eaten it either but the idea of a light, baked vanillary custardy pudding teamed with ruby red quinces seemed just right for dinner on a chilly night. Clafoutis is a French dish commonly made with cherries and there seems to be as many recipes published as there are cooks. After comparing four from reliable sources I decided to (almost) stick to the recipe Francesca has used which she attributed it to Julia Child. I can’t believe I had left it so long in my cooking life to make Clafoutis. It’s simple and quick to prepare and totally delicious. It was good hot from the oven with a dollop of cream, it was good cold from the fridge with yoghurt for breakfast. Thanks Francesca, I see a lot of clafoutis in my future. Put all the ingredients except the quinces into your blender jug in the order listed. Process the batter on the highest speed for 1 minute. Pour 1.5cm of batter into the base of the pie dish, then place it in the oven and bake until set. Remove the dish from the oven, spoon the quinces over the cooked batter then pour the remaining batter from the processor jug over the quinces. Return the dish to the oven and bake until the batter is set, puffed and golden 20-25 minutes. Remove the clafoutis from the oven and allow to rest for 5 minutes. Dust the surface of the clafoutis with icing sugar and serve immediately. This is gorgeous. I have never cooked with quince before! Do you know the flavour? The unique flavour and perfume of the cooked fruit makes the effort worthwhile. I’m trying to hit the like button but its not working so “like”! not sure why but thanks…..
I’m so pleased you made this one Sandra. I have made it once this season and still have a basket of quinces to deal with. To me, its a great combo, without too much effort. And nice for breakfast too. Yum! I am loving rhubarb at the moment…..would this recipe work with it? Could the rhubarb be too tart? An awesome adaptation using quince, book me a table for two! I have cooked Clafoutis with cherries before. Always a satisfying dish. I love the idea of this version. It looks to me like a sort of ‘deep pan’ version. Lovely job Sandra. Hi Sandra, that is simple. These types of dishes are perfect for around the fire in winter. I will have to remember to make it this winter is it ever gets cold enough for a fire. How lovely Sandra! After seeing her photo on Instagram, Linda (from La Petite Paniere) just sent me through her recipe for Flognarde, which is pretty much the apple version of Clafoutis. I’m very much smitten by the idea of all these lovely seasonal adaptations that don’t require cherries! Thanks for the inspiration yet again. Gosh, the labour, but so worth it. The only tragedy is that they won’t last forever! I’m a fan of raspberry clafoutis myself, for when that sad day comes. Pining for apples and garlic and dried fruit… Once we’re back from this weekend’s trip, I’ll be starting the challenge phase. Not looking forward to that, but at least it’ll widen the scope. This entry was posted on May 17, 2018 by ladyredspecs in Baking, Breakfast and Brunch, Cooking, Desserts, Food, Fruit Desserts, Light dessert, recipes, Warm Puddings and tagged autumn pudding, clafoutis, eggs, flour, hot pudding, milk, quince, sugar, vanilla.